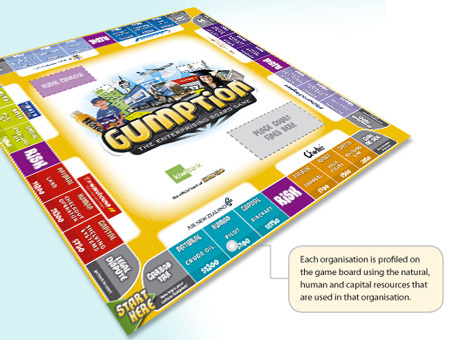 Gumption is a fantastic board game that will be loved by families, students and schools. Not only is it great fun to play it is also educational. Gumption is all about business and economics. 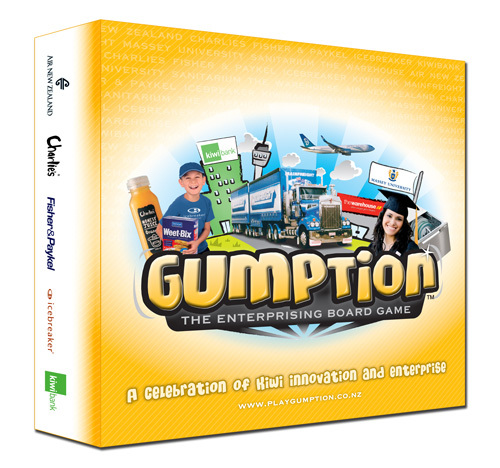 It is a highly interactive game for kids that requires players to be enterprising in pursuit of victory.Gumption has been created by Mark Snoad (HOD Business at Ormiston Senior College) and was launched at the Education Expo in June 2010. Since launch, Gumption has been enjoyed by students, teachers, adults and children throughout New Zealand. The response has been fantastic. For ages 8 to 108! If you would like to order the Gumption Game direct, please click on the icon. For bulk pricing options, please contact us with details of your request. "Just wanted to endorse this fantastic board game! Baradene bought 10 sets last year for Enterprise Studies and the response from the girls has been enormous! It introduces the concept of risk taking, which is an important concept for entrepreneurs. A key feature is that it uses NZ businesses on the game. It is a fun board game, suitable for the whole family. In fact, I joined in and played with one group that was short of players and thoroughly enjoyed it. Thoroughly recommended." "The students absolutely love Gumption! I taught my maths class (the top Year 8s), who were instantly hooked, and they took it back to their homeroom classes to teach the rest of the students. I’ve seen it in action in classes since then, with students of all abilities having an absolutely marvellous time with it. Let me know if you develop any more games!" "I have to say that it was a massive hit this Christmas!!! Being kiwis living in Australia my family were delighted to play a game not only made by a kiwi, but featuring iconic Kiwi companies. I cannot wait to get my Aussie Army mates to play. Thanks for the hours of entertainment!!"